Those huge snow jumps I remember as a kid? I’m sure they were more like this. 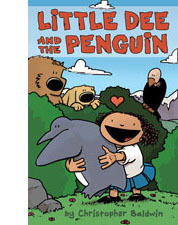 Oh, and hey, “Little Dee and the Penguin” got a starred review from Kirkus! How cool is that! Let me tell you, pretty dang cool. Never stand in front of the train of earnest enthusiasm. I love the pristine quiet of winter, as well as being the one who stomps the first path. Vachel’s problem is my problem. Can’t stop to enjoy things, got to barrel on to the new thing. I always envision this stuff in my head. I think, well, in an arc going mostly straight up, there must be a point where you’re barely going up or down, and so you’d land perfectly softly. In reality it hurts more though. I am a perfectly mentally healthy human being. Honest. That penultimate panel needs a snowy “crunch” sound. As a kid I DREAMED of doing this. I find that sometimes when people are busy arguing/debating (and sometimes that includes me) they miss out on the real action. I don’t recall if I was trying to express that, or if it was simply a truth that came through. Oh, I remember so well as a kid imagining that sledding was JUST LIKE THIS in the land of AWESOME. usually it was slower, less dramatic, and more painful. The tragedy of childhood.